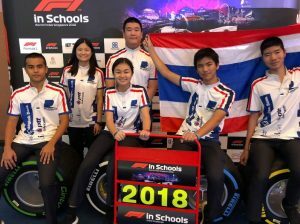 Singapore (Singapore) – October 19, 2018 (travelindex.com) – Pursuit Racing from Amnuay Silpa School was chosen to be one of Thailand’s representative teams to compete in the F1 in Schools World Finals 2018 recently. Over eight months of hard work and dedication was put into the preparation of the project in all aspects ranging from budget planning, recruiting sponsors, conducting research and experimenting to build the fastest model-sized F1 car, and coming up with a marketing and social media strategy. These responsibilities covered three main areas, engineering, marketing and finance, and were divided amongst Pursuit Racing’s six talented team members consisting of Year 9 and Year 12 students, aged 13-16 years. Three team members competed once before as part of last year’s team, while the other three were recruited this year. The team left for Singapore on the 6th of September to submit their car and portfolios and register for the event. Before the competition, held from the 9th to the 12th of September, they assembled their pit booth at Hard Rock Hotel, Sentosa, which was the competition venue for the event’s fifty competing teams from 24 countries all around the globe. In terms of the actual car racing at the event, Pursuit Racing ranked second in terms of the overall race time, had the fourth fastest car, and was fifth seed for the knockout round of 16 final teams. Aside from the car racing, the final overall team results also took into account the engineering, business and pit display scores and were announced on the evening of the gala dinner. Pursuit Racing came in sixth place out of fifty, making it the highest scoring Asian team for 2018! The winning team was Horizon from Australia, and the teams in second to fifth place were CJJ Autovinco from Ireland, Perspective from the USA, Alacrity Project from Greece and Origin from England, respectively. Participating in the competition would involve various costs such as the registration fee, car manufacturing costs, and travel and accommodation costs and teams were given the freedom the choose how to raise funds. Pursuit Racing decided to approach organisations that support education for Thai youths and was fortunate to be sponsored by 12 organisations including Bangkok Bank, PTT, Bangkok Airways, Insight Telco, Bira Circuit, Jorakay Corporations, CTC, Autodesk, Thai Star Shipping, CP Meiji, Amnuay Silpa School’s Parent Teacher Association, and Amnuay Silpa School. “Thank you to all our sponsors for making our participation in this competition possible, and for helping make Thailand known in the world of F1 in Schools™. We were honoured to present our project to so many corporate executives and grateful for our sponsors’ beneficial advice on the competition, university studies and our future careers. We’d also like to our parents, who guided us through this project helping us whenever we encountered something we didn’t understand or got stuck. Thanks to the parents’ professional experience, we gained skills and knowledge we wouldn’t have been able to find elsewhere,” added Akapat Thammongkol, the team’s marketing manager. As one of the main purposes of F1 in Schools™ is to allow students to experience working in an actual business, the team made sure to work together as often as possible, both online and in meetings, and were welcome to ask for advice from professionals. For instance, they spoke with professional engineers, contacted the cofounders of Brand Now Asia to learn about marketing, and received assistance from Krinbourne Communications in publicising their story. Mr Pantachak Wong Preecha guided them in dealing with and contacting many sponsors and they met with Mr Philip Massoud, a professional race car driver for inspirational and motivational advice. Pursuit Racing also received advice from Amnuay Silpa School teachers. Moreover, the school provided support by investing in car manufacturing equipment and allowing the team to use the equipment after school hours. They also are very grateful for the kind manufacturing support of Mr Robert Ortiz. F1 in Schools™ challenges the creative thinking, ability and understanding of secondary students and it is based on the actual Formula One. Using STEM (science, technology, engineering, mathematics) every team must design and manufacture carbon-dioxide propelled miniature cars and race them on a 20-meter track and effectively integrate all this management, marketing and finance. About Amnuay Silpa School: Amnuay Silpa (ANS) is a bilingual school offering a combined Thai-UK curriculum. With over 90 years of history, the school offers education from the foundation phase to the secondary phase, and has over 70,000 alumni, including six former Prime Ministers. Established on the 24th May 1926, ANS was accredited by Exeter University as the first and only Thinking School in Asia in 2013 and was awarded Advanced Status by the Department of Cognitive Education at Exeter University in 2017. About F1 In Schools™: F1 In Schools™ is a global multi-disciplinary challenge that inspires teams of students aged 9 to 19 to use IT, CAD/CAM software, physics and aerodynamics to design, analyse, manufacture and race model F1 cars and to learn about branding, graphics, sponsorship, marketing, leadership/teamwork, media skills and financial strategy in setting up their own enterprise.